I keep calling this thing “Ignis” instead of “Agni”. Damn Latin. In any case, after doing the first two quests of the game Yurizan feels some sort of aura coming from the temple nearby. More after the break. 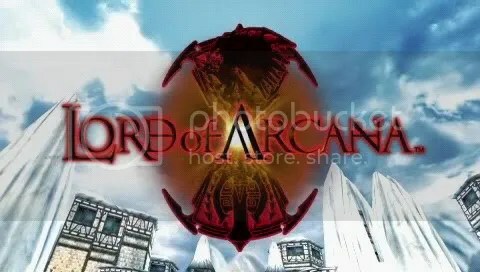 Lord of Arcana #2 – Discrimination? A lighter title picture than the previous one. So after having beaten the Nidhogg, we are treated to an FMV sequence where the warrior (you) must go on and take the path towards become a Lord of Arcana. More after the break. I have a plugin on my PSP that allows me to take screencaps of whatever is on my screen, which is essentially helpful for things like this. This’ll be my first time blogging a game, and I imagine that this post will be my first impressions of the game as the rest of the posts will probably be short posts. 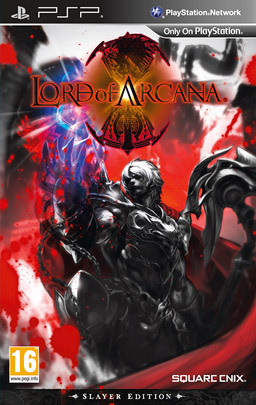 So, Lord of Arcana came out today in Europe, while it came out over in America a few days ago on January 24th. My best friend, Leevan told me about this game yesterday when he saw it at Gamestation and we went there to look at the casing. I was immediately drawn in by its cover art which was pretty damn amazing. I looked at a few screenshots and I immediately thought that this would be something among the likes of Bayonetta, Dante’s Inferno, Devil May Cry, etc. Turns out it isn’t like that. 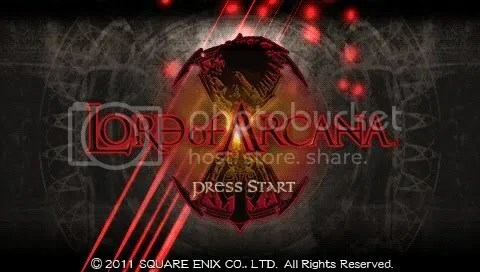 The game is more like the Monster Hunter, Tales of, and Phantasy Star series. More after the break. Since I’ve been playing DISSIDIA 012 Duodecim Final Fantasy Prolugus, I though I’d write my thoughts on how the new characters play out. At first, you’re only able play as Lightning and Kain as the new characters. The other new characters (aside from Prishe and Gilgamesh) appear in the game, but only appear as the enemy CPU or as assists. With that said, here my thoughts on how Lightning plays out. The main thing about thing about Lightning is about how versatile she’s supposed to be because of the fact that she can Paradigm shift into Commando, Ravager and Medic. Correct use of these 3 modes is crucial to mastering Lightning as a character. Her general speed in battle is quite average. She’s probably about the same speed as Warrior of Light in terms of running speed and attacking speed. Lightning has a wide range of attacks due to being able to change modes. In Commando form, all of Lightning’s attacks are physical. She doesn’t have many brave attacks in this form. Only two for both ground and aerial positions. She only has one “Brave to HP” attack, whereas someone like Warrior of Light and Onion Knight can chain Brave attacks to HP attacks almost any time. She this ranged attack called Blaze Rush where she uses her gun to shoot the enemy multiple times. If it connects, then she rushes the enemy. Whilst the attack is good for wall rushing, the accuracy of her bullets are really pathetic and are useless against higher AI enemies. She also has Ruinga which I’m not sure why it’s in Commando form, but whatever. In Ravager form, she has access to magic attacks. Personally, I find this mode to be more useful against higher AI enemies. Thundaga is a good defensive technique as it creates bolts of lightning around Lightning (lol). What I’ve noticed is that it pressures the enemy to dodge around. Also it can protect you against projectile attacks. She has a Fire spell but it’s pathetic, justl like Firion’s. It’s really slow and useless. One of the best attacks in Ravager mode is Army of One which is basicaly a flurry of sword slashes and gun shots before sending the enemy into Chase Mode. It’s a hard attack to connect against higher AI enemies so it may require some pressuring. This can be done by using an assist, or using Watera. Watera is a really helpful spell for pressuring in my opinion. It works the same way as The Emperor’s Flare attacks. Lightning casts a huge bubble of water that slowly approaches the enemy. The enemy will usually try to dodge it, from where you can catch them with an assist attack or a ranged HP attack. Sometimes the enemy will guard against it and it will be reflected, however when guarded, they will be staggered leaving them prone to attack. In Medic form, you cannot attack at all; only heal. Medic isn’t really a useful mode in it’s own right, and I only use it’s healing abilities to help with avoiding being broken. Her HP attacks are pretty disappointing unless you have access to all of them. In Prologus, the only aerial HP attack she can use is Thunderfall which attacks the enemy with a bolt of lightning, no matter where they are in the field. Pressuring is needed for this attack to hit if you’re facing a high AI enemy. To conclude, Lightning is a character that requires a bit of patience to master. Of course, not to the extend of that of ExDeath or The Emperor, but given that she has 3 modes, you’ll need to know how to use them all. I give Lightning a personal rating of 7/10. Yuna in her X outfit.